A good-quality manual push mower can have several benefits over a gas or electric-powered alternative. Though it may not be the quickest tool for getting the job done, a manual push mower is far quieter than one that runs on a motor, as well as producing less environmental and noise pollution. What Makes A Good Manual Mower? Our pick of the best manual push mowers available is the American Lawn Mower 1204-14 14-inch model. Though it struggles with smaller debris such as rocks and twigs, this is a common problem suffered by many models of push mower, and one that is easily overcome. 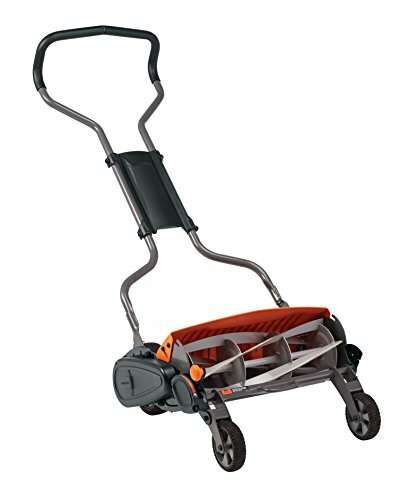 If you're looking for the ultimate best push mower, money no object, the Fiskars StaySharp Max is probably the mower for you. For those on a tighter budget, the 16" Greenworks 25052 means you don't have to sacrifice too much performance & quality to save money. Mowers produced by American Lawn Mower are all operated manually, with no gas or electric-powered engines. An alloy steel frame provides the durability needed to keep this push mower in functional condition long-term, while polymer wheels are puncture-proof and provide little resistance and friction, making the mower effortless to push. Where the mower has more difficulty is in the navigation of ground full of debris such as small twigs or stones; this type of obstacle can result in blades locking up. However, this is a problem easily overcome by raking the lawn prior to mowing it. One problem that traditional rotary-bladed gas-powered mowers cause over the long term is a reduction in grass quality, as grass is ripped and torn by fast-rotating blades. Conversely, this 1204-14 model carefully snips each blade of grass, preserving the health and vital fluids within each blade, protecting the lawn from disease and decay. With a 14-inch cutting path, it's easy to get full coverage of your grass, although getting the borders closest to fences and foundations can be tricky. The adjustable cutting height of this push mower ranges from 0.5 to 1.75-inches. This minimum cutting height won’t suit everybody; that said, not all push mowers feature an adjustable height setting, so this is a reasonably trivial issue. What’s more, a string trimmer can be used to pick up the slack if necessary. This manual push mower includes a limited 90-day warranty, which covers potentially defective parts at the point of purchase. Although this is a reasonably short warranty, the likelihood of a problem arising with a product of this build quality is slim, plus there are few moving parts making up a push mower, reducing the chance of component failure. This highly attractive design comes in at the upper end of the price range for this type, and has a range of features that help to justify the increased cost. An InertiaDrive reel helps tackle all varieties of grass, better handling those tough spots that often hold up cheaper push mowers. At the same time, most users find this mower easy to push. The mower is simple and quick to assemble on arrival, and has a broad range of height settings, from a minimum depth of 1-inch up to a maximum of 4-inches. Additionally, we much prefer the use of a mounted grass chute for diverting cut grass over any kind of bag, as most bags will tend to fall off when they become heavy. One other plus point worth a mention is the design of the mower’s wheels, which are inset, as are the blades. Both components extend to the full width of the mower, meaning that you won’t have any problems with missed edges around foundations, fences or walkways. 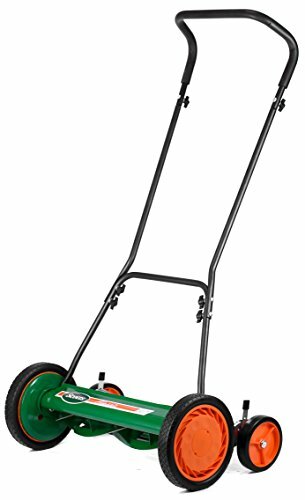 Although easy to push around the lawn, this push mower is still reasonably heavy at slightly over 50 pounds in weight. 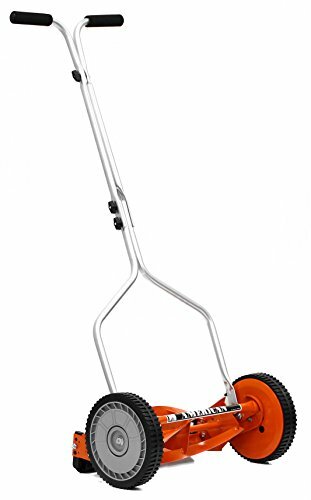 This can make carrying the machine to and from the lawn a more arduous task if you it is not in close proximity to the garage where the mower is stored. The warranty for the Fiskars StaySharp mower is a limited 3-year cover that only extends to any manufacturer defect or component failure. However, the build quality is good. and this shouldn’t be a common occurrence. If you're after a mower that's much cheaper than a gas-powered machine, yet won't sacrifice on quality, then you'd do well to opt for this model. The cutting path is 20-inches wide, which is the upper end of the scale for push mowers, while the cutting height can be adjusted through 9 different iterations. The combination of a lightweight frame, and innovative dual-wheel tracking technology, help to keep maneuverability of this push mower at the forefront of the design. That said, there’s one minor niggle with the construction of this mower that we shouldn’t neglect to mention, which is that the bolts securing the handle tend to loosen after prolonged periods of use; they’ll need tightening from time to time, to keep them secure. Unfortunately, it’s mostly the lack of a solid warranty that lets the product down somewhat. A limited 3-year warranty covers only defective parts, and any replacements must be shipped at cost to the customer. This push mower has a 16" cutting path. Double 10-inch front wheels elevate the blades to a minimum height of 1 1/8-inches, with a maximum height of 2 1/4-inches. There are also rear rollers, but they don’t do much for the stability of the unit overall. A common feature of the Greenworks brand of push mowers is their inclusion of a rear-mounted bag, which is designed to catch grass tossed behind the blades. At first, the feature is well-received. However, as soon as it gains any real weight from the mounting cut grass, it begins to struggle in staying attached to the mower and is liable to fall off. It’s far easier to remove this attachment and allow the cut grass to compost into the lawn. 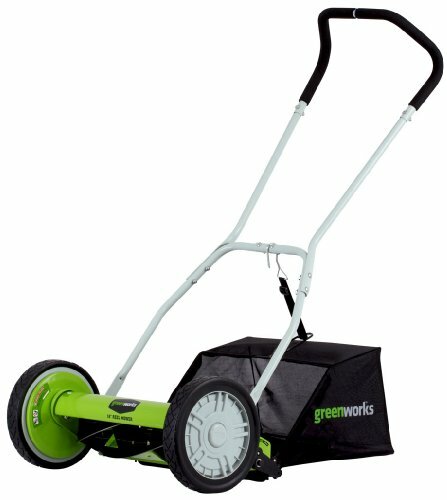 The Greenworks push mower is surprisingly sturdy, given the low weight and reasonable price. This model is available in 16", 18" and 20" cutting widths. The warranty is a class-leading 4 years. There are two things to consider when it comes to the maneuverability of your prospective push mower: the actual weight of the item itself, and the ease with which it can be maneuvered across the lawn. There’s little point in owning a lightweight machine that is difficult to move around due to poor wheel design; similarly, an ergonomic mower that’s cumbersome and difficult to budge wouldn’t be very good either. Look for something that isn’t too heavy to transfer from the garage to the lawn, but that won’t tire you out after 5 minutes of usage. Cutting height is typically adjustable and allows you to choose at what height you want to cut your grass. The window afforded by a machine can vary wildly, but the smaller the bottom number and higher the top number, the better. Push mowers often struggle with taller grass, pushing it flat as opposed to cutting it; so, if you’re the type of person who doesn’t mow the lawn frequently, you’d be best suited to a machine with as tall a cutting height as possible. Again, there are two factors to consider here. Firstly, you should consider the cutting width specified in the product description. If you have a large lawn, but purchase a machine with a small cutting width, then you’ll be spending far longer mowing the grass, making multiple passes. For smaller lawns, a cutting width of 14 to 16-inches might suffice, but for larger areas, you’ll want to consider something around 20-inches. Secondly, you should consider the design of the push mowers wheels, blades and frame. If you have numerous fences or foundations against the edge of your lawn, then any mower that doesn’t have inset wheels won’t be able cut right up against the boundaries. This could result in untidy edges, unless you invest in a string trimmer to pick up the slack. Push mowers all handle grass clippings differently. Some will funnel the blades into a bag, others will divert the grass off in a chosen direction, and some will simply let the grass fall to the ground to decompose. If you’re not too worried about the appearance of cut grass on your lawn, then the latter option might be the cheapest for you. Consider that bag attachments often have problems with remaining attached when weighed down by grass, and they can get in the way, too. Maintenance and cleaning of a manual push mower is much simpler than that of an electric or gas-powered lawn mower, not to mention carrying less risks. Since there are no electric or gas-powered components, there’s no risk of the machine kicking into gear while your hands are near the blades. The basic design also means that you don’t have to spend time emptying oil or gasoline from their respective tanks. Push mowers can be cleaned with a hard-bristled brush, detaching the blades and any grass-catching accessories. It’s recommended that you wear gloves to avoid any accidental scrapes on sharpened blades. Do you own any of the manual mowers mentioned here? Did you choose a different one? Let us know in the comments!